Vacation rental cabin / bungalow. Sleeps 8, 4 bedrooms, 2 bathrooms. Cats, Dogs allowed. Warrensville, NC - Situated on the banks of the New River is "Waters Edge", a true vacation destination! 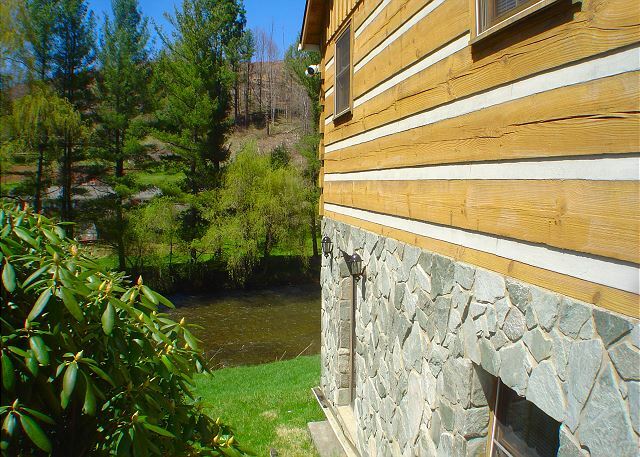 This three level cabin offers easy river access, and wonderful river views. The main level offers a great room with leather seating, electric fireplace Cable TV & DVD, dining area & stocked kitchen including dishwasher for easy cleanup. The master bedroom with plush king bed and full bath are also on this level. Upstairs is a loft bedroom with queen bed. The lower level offers a den with TV and futon for additional sleeping, & a 3rd private bedroom w/double bed , & another full bath. 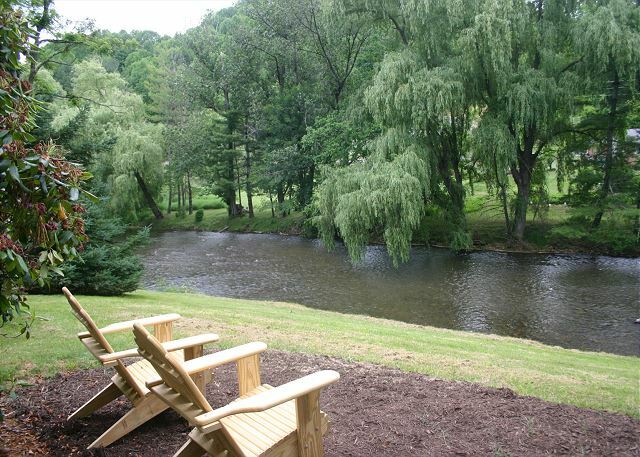 Soak in the new hot tub while watching the river as it slowly meanders by. If you want an adventurous vacation of tubing or canoeing this is the place to be. 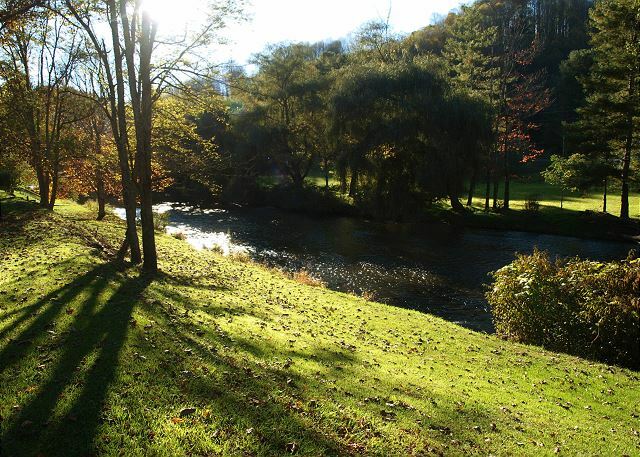 And best of all, this part of the river is stocked with trout so bring your fishing pole! Easy year-round access & pet friendly. Waters Edge is a Carolina Mountain Properties & Rentals property. Our calendar and rates are updated instantaneously. Contact us at 800-628-2663 to reserve. We strive to make it as easy as possible to stay at one of our properties. We will notify you proactively when an early check in is possible and you’ll receive the comforts of a luxury home when you arrive with a starter supply of paper products, hand soaps and lotions. In addition, we offer 24/7 emergency after hours service. Carolina Mountain Properties & Rentals uses one of the industry’s most trusted brand of software to securely store all guest data. All of our vacation rentals follow local and state tax rules. Each reservation includes applicable taxes, linen cleaning fee, and a processing fee. Carolina Mountain Properties & Rentals also offers an optional trip interruption insurance to protect your investment. Need heat in Basement. There are no cookie sheets to cook on. We wrapped tin foil around the oven rack to make biscuits. There is only one frying pan and it is warped. Need ice maker hooked up. Every thing else was fine. Thank you for leaving a review of your recent stay at Water's Edge. We will be looking into the need for additional pans and cookie sheets and those will be added. Thank you for leaving a review of your recent stay at Water's Edge. The heating issue has been corrected. We did provide you with additional heaters during your stay. We look forward to having you stay with us again. Great place to stay. Very little traffic noise. Thank you for reviewing Water's Edge after your stay. We are happy you enjoyed your stay. The cabin is located off a quiet road with very little traffic. We look forward to having you stay with us again. Our experience was very nice. We loved that we were able to bring our sweet fur baby with us. Cabin was clean beautiful view of the river. A little close to the road which concerned me with my dog but we worked around it. No more than two cars can park in the parking space. With those tow thing said we had a great experience. Overall nice cabin. Could use some TLC. Doors and screens hard to open or slide. Fuel oil odor in basement. Being on the river was nice. No central air. Only 2 window AC units that worked OK. Again overall nice cabin. Waters edge provided comfortable accommodations for 8 friends and family. The Cabin sits on a beautiful section of the south fork of the New River. Normally we float the Todd area, we found no other tubers on this section of the river and saw only a couple other people. Peaceful quite! Although the driveway is a little short, there is ample parking along the left side of the house. The yard was nicely mowed, house was clean, hot tub was small but very nice. There is a small spring stream flowing along side of the house. If floating or fishing is your thing, the river offers great runs up stream or flowing down toward the ****. The down stream run is more adventurous. Although the house looks small in the picture, there are several open areas and several quiet small room areas. In a nut shell, four days was not long enough. Relax and enjoy! In the summer would recommend an air conditioner in the master bedroom. ( better yet add central ac throughout the house) The view to the river is great, be very careful if you desire to go to the waters edge, hill is steep. Parking is a challenge if you have more than one vehicle and if those vehicles are bigger than a car. Overall a great experience, enjoyed having time to relax. Access to the river was awesome. Albeit the house was a little close to the road and the back yard was steep, we really enjoyed our stay. The house was really nice and the amenities were great. Thank you! We thoroughly enjoyed our time. The first night it snowed! Just beautiful. Thank you for taking the time to leave a review. We are so glad you enjoyed your stay. 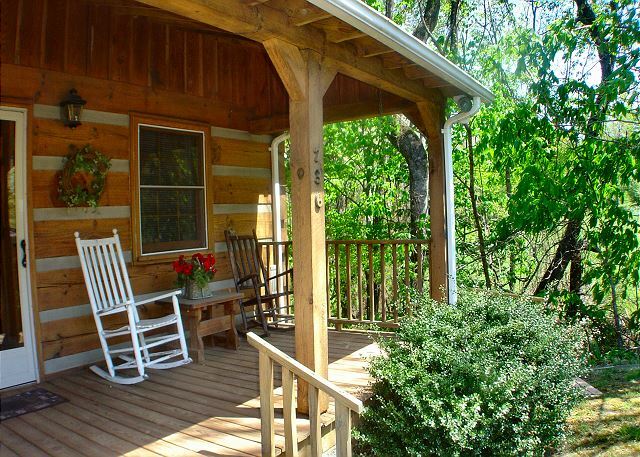 This cabin is very pretty, especially the front porch. There is a small mountain view in front and the beautiful river in back. The rental company are awesome to work with. We have stayed in many of their cabins. There are some things I will mention. If you are going to spend lots of time outdoors, fishing, ect. you may be better at another one of their cabins. The hill to the river is steep which they had told me. Parking is right off the road and we managed to squeeze three cars there but it was tight. If you just enjoy the views than this cabin is great. Two sitting rooms over river and again that wonderful porch with view and sounds of creek only feet from you. Fooseball table a big hit. Overall had a great time. Thank you for leaving a review of Water's Edge. We look forward to having you stay with us again in the future. Chris H from Charlotte, NC does not recommend this vacation rental. The property was very clean and quiet. The picture is misleading because it appears to have a bigger front yard. It is actually 50ft from the road. That was misleading. Otherwise great house. thoroughly enjoyed our stay. Description is exact. Great location for pets. Another item off the "bucket list" for mom. My wife and I have been vacationing to the West Jefferson area for a few years now and will be for quite awhile to come. The area, town, and folks are hard to beat. This particular visit was an amazing one. We took my wife's mom with us this year and the accommodations, setting, neighbors, were really great!! !We had some issues come up and did fill out the departure form that was left in the house for your use but apparently that didn't make it to you. I guess it was put with the phone call request to get the hot tub working. It was a big disappointment to us that there wasn't one check in on us or a follow up to our visit or request to get the hot tub working. Over all we enjoyed the house very much but left a list of items that were meant to help out the next groups that would follow. It was not a B list but one out of sincerity. The items were as follows. 1. The gutters were full and when it rained you got a shower entering or exiting and it dumps right on top of the grill. 2. The grease pan for the grill is missing and grease is building up on the wood deck. 3. Need gravel at the front entrance to help keep the floors clean. 4. Cigarettes in the ash trays and buckets. Were not smokers,,, yuck. 5. The A.C. was not very efficient to the master bed room. We had to get a fan to get comfortable. Odd that you don't have a ceiling fan. And you can forget about closing the bedroom doors. 6. The hand rails from the front deck down the side of the building was broken and just hanging there. 7. There was a stack of rotted benches on the upper deck. 8. We were there for a 5 day stay and got one roll of paper towels and two garbage bags. 9. The food rack on the grill was covered in rust and no brush of any kind to clean it. Beautiful cabin sitting right on rivers edge. Spacious, very clean and well maintained. Located off winding hwy 88 (great mountain drive) but only 20-25 minutes from downtown west Jefferson. As always Carolina mt property is the VERY best rental agency to deal with. Have rented with them many years. ..always trouble free. Yard slightly steep. ..not too good for elderly but inside sitting areas with great views made perfect vacation for my 80 year old disabled mom. BR on 1st floor with living area a plus. Second living area with BR downstairs for larger groups. This cottage was just what we needed! We were looking for something far removed from our everyday busyness and heat of the south, and we found it! The cabin was adorable and had everything we needed so we didn't have to pack a bunch of stuff from home. We spent our evenings fishing just outside in the river and relaxing in the hot tub listening to the birds and the river. The cutest town of West Jefferson was just 15 minutes away with wonderful restaurants and fun shopping. Numerous opportunities for hiking and siteseeing were a beautiful 50 minute to and hour or so drive away. The entire vacation my daughter kept asking if we could buy the place! I think that sums up our experience. House was clean and great for my family. Grilled hot dogs first night but ran out of gas second night. Hot tub smelled not sure about chemicals in it. Overall a experience. a guest from Conway, SC does not recommend this vacation rental. We were a little surprised about how close the front door was to the road. Also the view was not what we expected. We did not realize that there were houses across the river. Many houses! The cabin itself was very nice, but if you stay there, bring your own salt and pepper! The cabin also had an issue with ants.